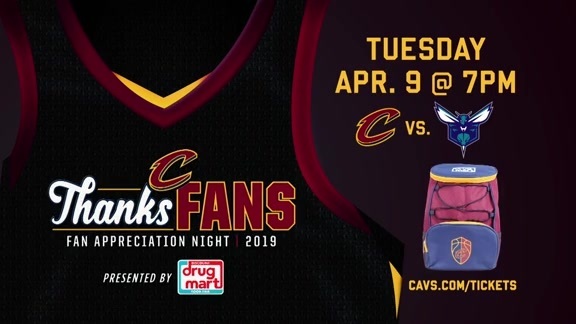 The Cavaliers 17th annual Fan Appreciation Night, presented by Discount Drug Mart, marks the final 2018-19 regular season home game and a great time to say ‘THANKS’ to the best fans in the NBA. More than $1 MILLION IN PRIZES will be given away throughout the night to fans in attendance at the Cavs vs. Charlotte Hornets regular season finale on Tuesday, April 9th at 7:00 p.m.
ALL FOR ONE, PRIZES FOR ALL! Fan Appreciation Night, presented by Discount Drug Mart, means no fan will go home empty handed! Every fan will receive a scratch-off ticket voucher that is guaranteed to reveal a prize upon their arrival to The Q. 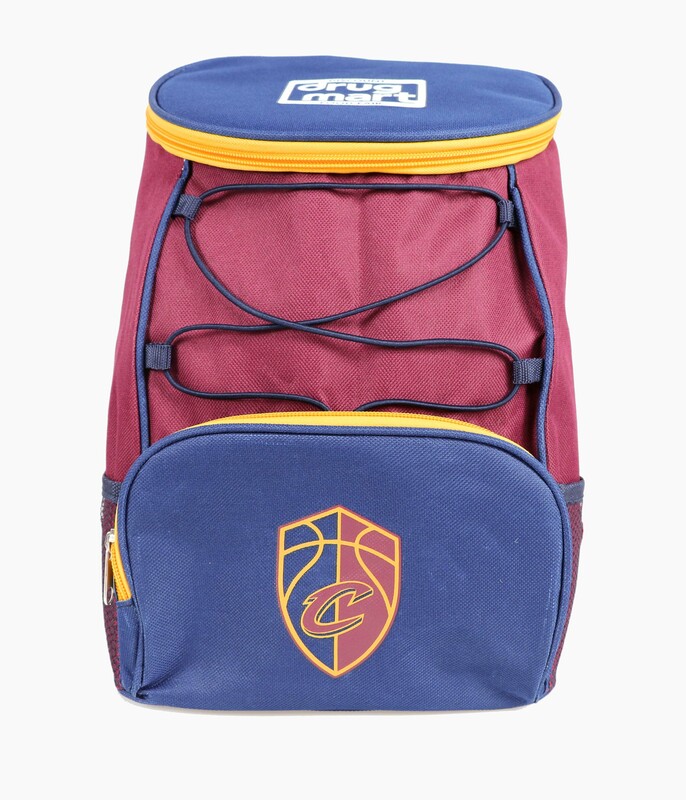 All fans in attendance on Fan Appreciation Night will also take home a cooler backpack adorned with the Cavs shield logo presented by Discount Drug Mart. The backpack was selected to be the night’s giveaway by members of Wine & Gold United, the team’s official club of season ticket holders. Throughout the game, the Cavs will randomly select entire sections of fans that will receive a variety of prizes that include gift certificates to local restaurants and retailers, water park passes, a free set of tires courtesy of Goodyear Tire & Rubber Company and much more. Fans can check out a very special vending machine located by the Discount Drug Mart Entrance on the south side of The Q (on Gateway Plaza across from Progressive Field) to “Push button. Get prizes.” including t-shirts and other various swag items courtesy of Rocket Mortgage by Quicken Loans. The first 50 fans to stop by Wine & Gold Nation Headquarters (Sec. 131) will receive special giveaways from the best fan club in the NBA! CAVS PLAYERS GIVE AUTHENTIC NIKE JERSEYS AND GAME-WORN SHOES TO LUCKY FANS! ALL fans in attendance will be automatically entered for a chance to be randomly selected to come down to center court immediately following the game where Cavs players will personally give away authentic Nike jerseys and game-worn shoes! Cavs mascots will also join in on the fun as Sir C.C. will giveaway his hat and Moondog his jersey. A TERRIFIC TEAM SHOP THANK YOU! 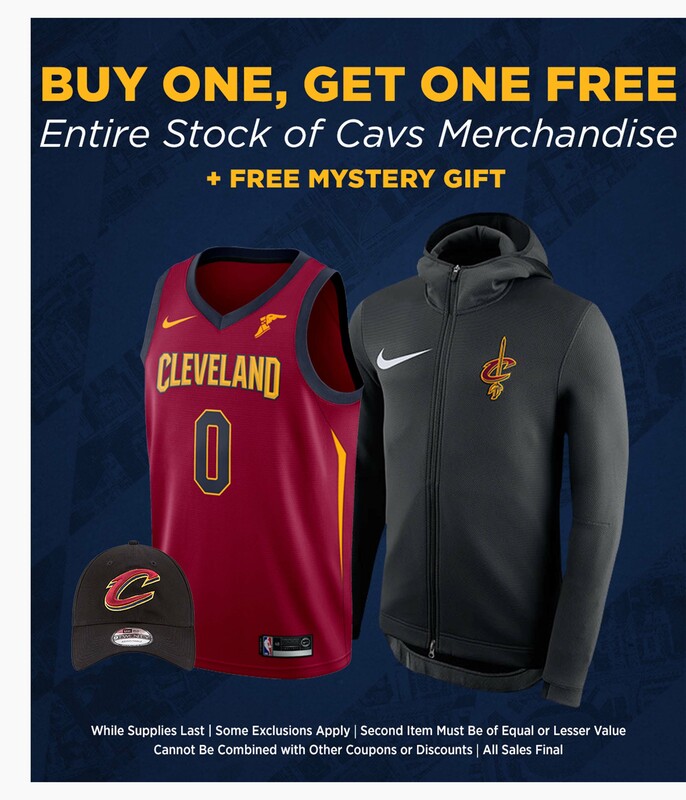 To celebrate Fan Appreciation Night, the Cavaliers Team Shop will offer fans a BUY ONE, GET ONE FREE deal on the entire stock of Cavs merchandise, both in-store at The Q and online at cavs.com/shop! (*Some exclusions may apply.) PLUS, all purchases in-store will include a free mystery gift, while supplies last. The Team Shop will also offer free shipping on all domestic orders on April 9th. #AllForFans ACROSS ALL SOCIAL MEDIA! Cavs Nation can join in on the Fan Appreciation Night conversation with hashtags #AllForFans and #CavsHornets. Fans can stay connected to the Cavaliers by following the Cavs on Facebook (Facebook.com/Cavs), Twitter (@Cavs), Instagram (@Cavs) and Snapchat (@Cavs).